Previously a duo, Mint Royale is now the sole concern of Neil Claxton. Visiting Mint Royale's Neil Claxton at his Manchester 'studio' proved slightly more difficult than we expected. The shift to a Logic-based, digital setup has allowed him to make music in the most unlikely places. "I love the idea that I'm not constrained by one environment," he explains. "I've written songs on trains and in cafés and pubs, and I spend a lot of time working very quietly on headphones down at the local library. It was really interesting to program basslines while listening to a woman tell her friend about a hospital appointment or taking her dog to the vet. I'm sure it all found its way into the music at some point." Originally a duo [Chris Barker left during the recording of the third album, See You In The Morning, in 2005], Mint Royale is now the sole concern of Claxton, who began his musical career remixing pop hits as part of Manchester's Development Corporation. Although best known for the acclaimed 2002 album, Dancehall Places, and 2008's chart-topping, break-heavy remix of Singin' In The Rain, Claxton has also drifted into the world of soundtracks and TV adverts --Singin' In The Rain was, of course, used for a Volkswagen campaign. 2014 has seen a definite shift back towards Mint Royale's music, though, with a new album due later in the year and live shows planned for May. Working at the library must have been a challenge. Didn't you disturb everyone with the constant boom-tssch from your headphones? "That's one of the consequences of shifting to Logic and digital... I've got used to listening to music on headphones at very low volume. At first, I was worried about not being able to gauge the level of bass in a kick drum, but then I realised there are actually benefits to that. It means that you stop worrying about the sonics of the song and just concentrate on the actual writing. "I've written songs on trains and in cafés and pubs, and I spend a lot of time working very quietly on headphones down at the local library." "Instead of wasting a whole morning trying to stop the low-end frequencies clashing, you work on structure. All you're thinking about is, 'Does this song work? Is it any good?' Once I'm happy with that, I start work on it at home and then finally take it to 80 Hertz in Manchester - my favourite studio - where I can listen to it at proper club levels." You don't find moving around disturbs the workflow? "On the contrary. Sitting in the same room, day after day, staring at a blank computer screen... that can be totally soul-destroying. Taking myself out into the world and watching people is quite inspirational. Listening to what they're talking about or the rhythm of a certain speech pattern. Travelling is great food for songwriting. I love the idea that you're going somewhere new." The current setup is a Mac running Logic? "Yeah. For years, me and Chris worked on Ataris and then on a PC - always using Cubase. We both had something against Macs, even though we'd never used one. People kept saying, 'Oh, you guys will love Logic',and one day Chris went and bought a Mac/Logic rig without telling me. He brought in a tune and I was like, 'Blimey! How did you do that?'" Mint Royale's music has always been quite sample-heavy. Did the shift to Logic make the process of handling all that audio much easier? "I grew up with the Akai S950, the 1100 and finally a couple of S3000XLs. That's where most of our sounds came from - minutely chopped up and messed around in ReCycle. The EXS sampler is better than the 3000, so, on a day to day basis, yes, it made things easier - especially as we were still able to use ReCycle. "But there's always a pay-off, isn't there? With Logic, you suddenly find yourself confronted with almost-infinite musical possibilities. If you're not careful, you can suddenly find yourself disappearing into a black hole of stacked kick drums and multiple hi-hats." Before Logic and before the Atari, what was your first bit of kit? "I played electronic organ as a kid and, when I was about 15, I heard a Detroit house tune on John Peel's show. I can't remember what it was called, but it seemed to have some organ sounds in there, so I was immediately interested. Most of my mates were older than me and one of them had bought a couple of synths and a four-track - the four-track was definitely a Tascam and I seem to remember a Korg synth of some description, plus some no-name basic whoosh boxes. "With Logic, you suddenly find yourself confronted with almost-infinite musical possibilities. If you're not careful, you can suddenly find yourself disappearing into a black hole of stacked kick drums and multiple hi-hats." "Because I played electronic organ, they assumed I would know everything about music gear. I started fiddling around with that lot and my parents seemed very relieved that I'd found something to keep me occupied, so they bought me a Casio CZ-3000. I borrowed a TR-505 and, suddenly, I had a little setup, all running from my dad's BBC computer. "Next was a Yamaha SY77, which I used to knock up a version of Too Blind To See It by Kym Sims. I'd heard the song on the radio, but didn't know who it was by, so I made my own version and took it to the local record shop. I played it to them and said, 'Can I have this record, please?'. "Anyway, word got around about this kid who made the house tune and I suddenly found myself in a proper studio working on proper records. The first three big records I worked on were Urban Cookie Collective's The Key, Gabrielle's Dreams and Staxx Of Joy's Joy. All three were hits and I became part of a remix team called the Development Corporation - music was my job!" How did you get from there to Mint Royale? "I did that for a couple of years, but it was very much a pop thing and a bit of a conveyor-belt. Although I was having the time of my life, it just got to overload and I needed a break. "As luck would have it, I bumped into Chris, an old mate, and we talked about doing something together. His approach was sampling from obscure records and mine was very much sampler-based, so it seemed to make sense. He came round to my house and we just set up a couple of turntables and flicked through vinyl while we had an eight-bar drum loop cycling on the computer. If anything sounded interesting, we'd stick it down and then start looking for something else. "I played what we'd been doing to a couple of people I knew and, from that, we got offered the job of remixing Terrorvision's Tequila and a track by Kenickie. Both of them charted - that was the start of Mint Royale." Was the sampler your main instrument? "Definitely! There was a Korg Prophecy, an MS2000, a Roland JV-1080 and a JD-990, but real keyboards and synths hardly ever got used. If we needed a filtered 'synth' noise or a nasty lead sound, we'd invariably look for something on a record, throw it in the S3000 and mess around with it till it sounded like we wanted it to sound. "The 3000 and 1100 were the instruments that really broadened the musical horizon for me. When I was working on the Dreams remix, we needed to find some way of changing a 90bpm RnB tune into something that could be played in clubs. We couldn't afford audio back then, so the only way we could do that was timestretching in the sampler. A fully maxed-out 1100 was the first machine I'd come across that allowed me to timestretch a full vocal. And, most important of all, it timestretched it in an acceptable way. That was a landmark moment!" What's happened to all the old gear? "Well, as we got more successful, we found that we were pushing our sound more and more, and that meant working in better and better studios, which is how we ended up at 80 Hertz. We looked at our limited setup and thought, 'What's the point in trying to use our few bits of gear when we can go to 80 Hertz and have all that vintage hardware our fingertips?' Our stuff either got shoved in the garage or loaned out to other people. The arrival of Logic just sort of completed that process." Is there a favourite piece of gear at 80 Hertz? "It's probably just the availability of top-end mics and preamps. If I tell them I'm coming down with a new vocalist, they get me a load of mics and preamps set up and we A-B every combination until we find something that works. "I just love the sound in that studio. Apart from vocals and live stuff, there's not really any songwriting that goes on there; it's all about sonics. It's all about mixing and production. We break a song down into maybe ten stereo pairs, run that from my Apogee setup into a Manley EQ and then sum everything back together in the Neve Genesys desk. That's one trick I've learned over the years: music made on a computer sounds much better when it's not summed in a computer. "If we needed a filtered 'synth' noise or a nasty lead sound, we'd invariably look for something on a record, throw it in the S3000 and mess around with it." "I love the Westlake BBSM-12s [monitors] they have at 80 Hertz. They're ace. I don't like mixing on Genelecs at all. I'm also very reliant on Sennheiser HD25s [headphones], especially away from home or 80 Hertz. Even in a studio with supposedly amazing monitors, I'll trust my HD25s more than their monitors until I really know how their room sounds." And you use a lot of software these days? "Yeah, my favourites are GForce ImpOSCar 2, Ohm Force Symptohm (love the morphing keys thing - so much weirdness) and QuikQuak Glass Viper, which is just an odd sounding synth. It's not very user-friendly but different enough to warrant the pain of programming it. Then there's the boring old Arturia stuff we all have but which is very good, although the way Arturia saves presets is stupid and could do with a massive simplification. "Then there's the Native Instruments stuff. FM8 for reproducing my old TX81Z patches (which it generally does pretty well) and I like Battery for drums, especially the multi mic'd real kits so you can mix like a real drum kit. "I'm a big fan of D16, so use Decimort, Toraverb and Fazortan on almost every mix, along with the IK Multimedia Classic Reverbs. "I have most Waves plugins. I especially like the NLS buss and the SSL buss compressor for pulling mixes together, the PuigTec EQP-1A and API 2500 compressor for bass, and SSL EQ and CLA-76 for vocals. "I used to love the Abbey Road brilliance pack on Snow Leopard and massively miss it in Mavericks as they've never made 64-bit versions. Easily the nicest software EQs I've used, and I've still not found anything similar. Hopefully someone will make a 64-bit version soon. I can't be the only person who would snap them up. "I still miss a decent sub bass plugin, though. I used to use a DBX 120x-ds many years ago, which was amazing. If someone could emulate that, that would be great!" "I find Stylus RMX is useful for just trying things out and I've got loads of old libraries for it. And I use EXS and ReCycle for sampling stuff myself, but Kontakt 5 for its massive library. I'm not dead keen on the strings, though, and have a real soft spot for the Big Fish Audio London Solo Strings sample library." Tell us how a typical Mint Royale session might go? 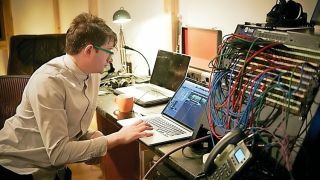 "I often group everything except vocals, bass and drums through the LinMB multiband compressor and SSL compressor to keep the relative level of the musical content in a mix constant without automating as much. "Generally, I only need to record vocals, so for louder people we use the Brauner VM1 or Shure SM7 into a Chandler Germanium and then into a Fatso compressor. For quieter singers an AKG 414 EB or an AEA R84 into an 1176, although the Brauner is pretty great for everything. I don't like too much compression on the way in, so the outboard is really just adding character rather than full-on compression. And if necessary we'll use the Neve desk EQ, which is the analogue 1084 vintage EQ. But again, I don't like to commit to anything too drastic at the recording stage. "I don't like too much compression on the way in, so the outboard is really just adding character rather than full-on compression." "In terms of finishing mixes at 80 Hertz, I aim to replicate what I've done with buss plugins but with nicer gear to improve the mix and warm it up so it sounds less digital. So in Logic, the mix will probably have stereo busses for drums, bass, music and vocals with some sort of overall compression and EQ on each, with maybe something further on the master buss. When I take it to 80 Hertz, we run those individual busses into the Neve and for starters use the analogue summing of the desk rather than Logic's digital summing. Then we'll start swapping out any buss EQ in Logic, replacing it with either the desk EQ or the Manley Passive Valve EQ. Then we do the same with compression, which always seems to involve the Manley mastering compressor, the Fatso and the 1176. "Once it's all sounding good, George will spend a further 15 minutes trying to convince me to run it to tape on his Studer to really make it actually analogue, but it still hasn't happened. Then I'll record the final output of the Neve analogue-summed mix and maybe semi-master it using the Manley EQ and compressor while I'm there." What's the back story on the recent single, Ring? "We had this tune and I'd always imagined it with a spoken word vocal. Just as a joke, I said: 'Wouldn't it be great to get Willem Dafoe?' I'd seen him on stage in Manchester and I knew that he'd got one of these instantly recognisable voices. You imagine that he talks in monologues. "Anyway, I put together a sort of demo using snippets of his interviews that I found online and we sent that to his management in the US. A few days later we got the phone call... He liked it and wanted to record a proper vocal. "My snippets of interview didn't really make a great deal of sense in parts, so some of it was rewritten by [BAFTA-winning scriptwriter] Danny Brocklehurst. I created a sort of karaoke version of the song for Willem to listen to and we did the whole thing over video conference. It's not often I get star-struck, but working with Willem Dafoe was different. I immediately turned into a giggling schoolgirl. "The funny thing was that, in the beginning, he didn't say it as I wanted him to. Can you imagine having to tell Willem Dafoe how to do his job?!" You've probably been asked about it a million times, but can we talk about Singin' In The Rain? "I don't mind talking about it at all. Mint Royale was only me by then, and Volkswagen came with this idea for a minute-long piece of Singin' In The Rain that would also feature a breakdancer. The weird thing about advertising people is that they make brilliant A&R men because they know exactly what they want. They often give you a reference track and some visuals - it gives you something to work with." Was there always a plan to release Singin' in the Rain as a single? "Not at all. The ad got lots of attention, so it seemed like a good idea to release it, but the sample had only been cleared for use in an advert; it took ages to get clearance for anything else. By the time it had all been sorted, the ad was off the telly and the single only got to about number 20. Then, of course, it got picked up by George Sampson [Britain's Got Talent breakdancing heartthrob] and it seemed to get a whole new lease of life." Moby and others have been heavily criticised for allowing their music to be used on adverts. Did you get any nasty comments? "In this modern age, the reality is that music is a commodity. That particular genie has been let out of the box and I don't think we're going to be able to get it back inside, so we might as well deal with it. I really enjoy the whole advert process. Someone says: 'Right, we've got an ad for a car and we want a Beach Boys track, but it needs to sound a bit different.' Or: 'We want something like this French house tune but faster'. As far as I'm concerned, working on ads has helped me make better music because it forces me to climb out of my pigeonhole."